Based on a true story, Gibraltar directed by Julien Leclercq (The Assault) and with a screen play by Abdel Raouf Dafri (A Prophet,Mesrine Public Enemy #1) is a taut, emotionally charged thriller which cracks along at a fine pace mixing political intrigue, personal loyalty and ultimate betrayal. 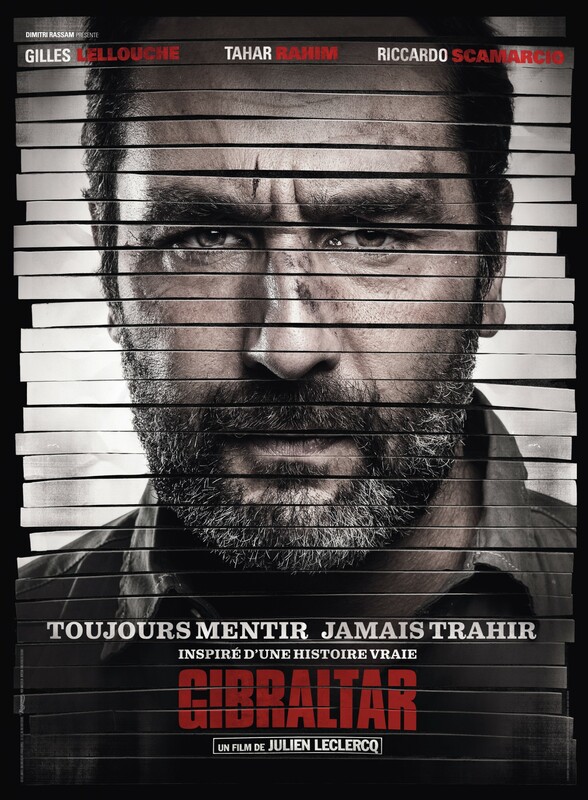 Gibraltar follows Marc Duval, (Gilles Lellouche), an ex-patriate Frenchman who is the owner of a run-down bar in Gibraltar in the mid-1970s, as he struggles to manage his ever-increasing debts. Through a friend, he is contacted by a customs official Redjani Belimane (Tahar Rahim) who is trying to stem the flow of drugs through Gibraltar from North Africa. Duval agrees to act as an informant by passing on information he gleans from the clients who come to his bar. And before long, he finds himself sucked into the murky world of international drug dealing where he meets the charismatic drug baron Mario (Riccardo Scamarcio). The tension hinges on whether the streetsmart Duval can outwit the gallery of thugs he comes across from both the criminal and the bureaucratic world? He is savvy but is he a match for these ugly villains? On his side, Leclerq has a fine trio of actors who manoeuvre and outmanoeuvre each other in the style of chess Grands Masters. Lellouche is wholly engaging as a man who puts family first, but clearly has a darker side which draws him towards the violent criminal underworld. Rahim, already known to international audiences through his central role in The Prophet, subtly portrays an ambitious young man who struggles at first with the compromises he makes to do his job, but is ultimately a weak character who prefers to endanger others rather than himself. Scamarcio fabulously oozes menace in every scene. Good looking, charming and ruthless he is a complex character who perhaps seeks to be a different man, but is clearly too obsessed with his own power.